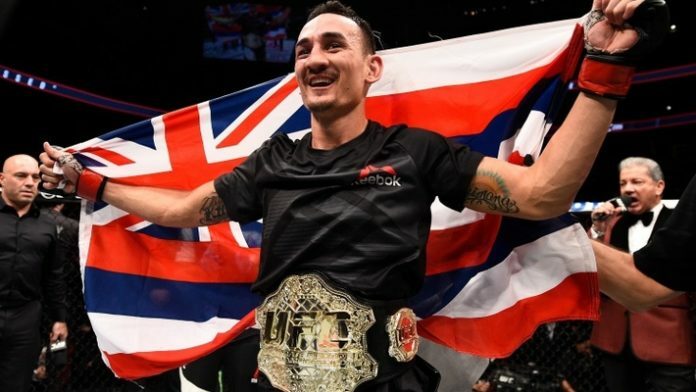 Max Holloway is back, and he’s ready to defend his featherweight title. “The Blessed One” will step back into the Octagon this December at UFC 231. He’ll defend his strap against Brian “T-City” Ortega in the pay-per-view’s (PPV) main event. Initially, the pair were scheduled to fight at UFC 226 this past summer. Unfortunately, the Hawaiian was pulled from the card after suffering from “concussion-like symptoms.” Ortega opted to wait for Holloway, prompting the UFC to reschedule for December. The match-up between the pair has been one of the most highly-anticipated fights of the year. Mixed martial arts (MMA) fans are hoping all goes well and both men are able to make the walk come UFC 231. UFC 231 goes down live on PPV from the Scotiabank Arena in Toronto, Canada on December 8, 2018. The card also features a bout for the vacant women’s flyweight title. Valentina Shevchenko will face Joanna Jędrzejczyk for the vacant strap. What do you think about the match-up between Holloway and Ortega?